GM Ashley dominates King's Island Open! 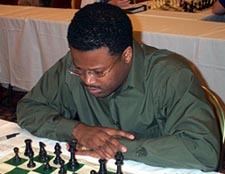 GM Maurice Ashley warmed up for his debut appearance in the U.S. Championship by winning the 2002 King's Island Open over a strong field. Held November 15-17, the tournament attracted over 390 entries to the Cincinnati area. The Open section was competitive with 50 players with 10 Grandmasters (one WGM), 5 International Masters. Play was dominated by GM Maurice Ashley, who defeated both GMs Ildar Ibragimov and Alexander Goldin on his way to a 4½-½ score, clear first and a $2580 first prize. Tying for 2nd with 4-1 were GMs Alexander Stripunsky, Alexander Wojtkiewicz, Dmitri Gurevich, Ibragimov, and IM Ben Finegold, who took home $516 each. GM Ashley told The Chess Drum that the King's Island Open was a "wild" tournament. After winning his first two games, he gave an exciting blow-by-blow account of his next encounter. "Then I had to play Ibragimov with Black. I sacked a pawn right away for some compensation. He kept trying to consolidate, and made a critical mistake that I did not spot. But my compensation endured and this sent him into huge time pressure trying to solve the problems. Soon I was aimed at his king and in a desperate attempt to defend with little time on his clock, he lost a rook." Now at 3-0 along with Stripunsky and Finegold (who were now paired to play in round 4), Ashley would play Goldin, the highest-rated player with 2½ points. However, the following GMs were in hot pursuit of the lead: Igor Novikov, Alexander Shabalov, Wojtkiewicz, Gurevich, and Pavel Blatny. Ashley had the white pieces and opted for the Ruy Lopez. In a zealous mood, the Brooklyn Grandmaster made an error while setting up a devastating sacrifice. The game exploded when Goldin sacked a pawn. Pieces started to fly about the board. "In fact, it looked like we were trying to 'one up' each other as to who could sac the most stuff! We both missed shots with him missing a killer in time pressure that would have stolen a piece for next to nothing. Instead, he got caught up in the heat of the sac fest and allowed me to get in the last sac that sniffed around his king. When the smoke cleared with time pressure over, his king was denuded… me up a pawn, and his pieces barely keeping it all together. A final error on his part sealed the victory." "So suddenly I was the clear winner of a strong Open for the first time in my long chess career. 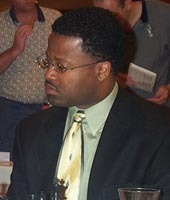 I had tied for first in Foxwoods (twice), I had even won an International (tournament). But this was my first solo Open victory and it felt pretty good. Hopefully this is a sign for the US Championships."